You’ve probably heard this a million times. The scale does not define your self worth. It’s really really honestly true. Your scales a liar. For many years I let my scale do just that. I allowed it to tell me if today was a good, or bad, or really, really bad day. A low number – hooray! great day! But a high number – a bad I’m-not-worthy-of-living kind of day. It was almost like my scale was taunting me. “Step on me..I’m your friend…I love you” and then BAM, the number was higher than yesterday. My scale was a LIAR! It didn’t love me! If it did that damn number would go down! And I was obsessed with weighing myself. I’m almost embarrassed to admit how much I used to weigh myself. Before the shower, after the shower, even after going to the bathroom (see? embarrassing). It was out of control. I knew it took exactly 2 days for a binge day to show up on the scale. I knew which days I could eat more before a WW meeting. I had it dialed in. I worked really hard to beat down the number on the scale. I still have a scale and I still weigh myself but only once a week. And if the number goes up a bit it’s not the end of the world. Because I’m not on a diet, there is no diet to fail..aha! One day I might actually get rid of my scale forever. Try weighing yourself less and see how it feels. It might make you panic at first, or feel out of control. If you weigh twice a day, go down to once a day, then to every other day. It’s very liberating! Comment below if your willing to try weighing yourself less and let me know how it goes! Remember, you are enough. You are perfect just the way you are. 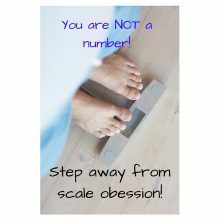 And your scale is a liar too – you are much more than that damn number!